Songthaews are small pick up trucks that you can jump on and off at will. They tend to follow a circular route, though you can always check with the driver where they are going. They have a covered roof and two benches in the back for sitting down; they’re also pretty cheap for short distances. As with the buses, songthaews won’t take you between the main beach resorts on the island, but they’re ideal for short journeys within the same general location. 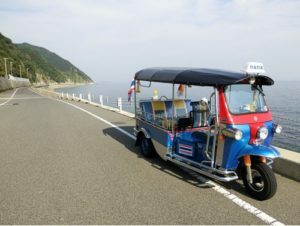 Phuket’s tuk-tuks are different from all the others in Thailand because they have four wheels instead of the traditional three. These are the most expensive transport you’ll find in Phuket, but they’re worth trying for the experience. You can give your driver information on wherever you’d like to go and then sit back and relax as he takes you there. Pro tip: make sure to negotiate a fee before you board, so as not to get ripped off. If you fancy driving yourself around the island, you could get a rental bike Phuket. Almost all parts of the island are accessible by bike, and both the rental fee and gas are cheap – so long as you ensure the bike doesn’t get damaged. You will be expected to wear a helmet, and it’s advisable to also have insurance in place, even if you have a lot of riding experience. Thailand’s drivers are like no others, and the roads can be dangerous, especially during rush hour. Although considered to be an expensive form of transport, taxis are cheaper than tuk-tuks in Phuket. Taxis tend to congregate in busy areas and you’ll easily be able to pick one up at the airport. You can’t miss them either as they’re bright red and yellow with a TAXI sign on top. When the red light is on in the front window, this means it’s not carrying any passengers and can be flagged down. Do make sure your taxi has a meter when getting into it, though, as non-metered taxis with flat fares tend to be very expensive. With this transportation guide in hand, you’ll find navigating around Phuket to be a breeze!